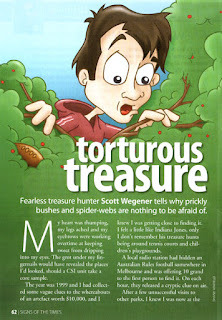 Fearless treasure hunter Scott Wegener tells why prickly bushes and spider-webs are nothing to be afraid of. My heart was thumping, my legs ached and my eyebrows were working overtime at keeping sweat from dripping into my eyes. The grot under my fingernails would have revealed the places I’d looked, should a CSI unit take a core sample. The year was 1999 and I had collected some vague clues to the whereabouts of an artefact worth $A10,000, and I knew I was getting close to finding it. I felt a little like Indiana Jones, only I don’t remember his treasure hunts being around tennis courts and children’s playgrounds.